Posted on July 21, 2016 August 21, 2016 , in Hot Tubs. Hot tubs have long been known for their therapeutic benefits. Whether you want to reduce stress, sleep better, or relieve aching muscles or other pains, a hot tub can help. While most hot tubs provide some therapeutic options, not all hot tubs are equally beneficial. By looking for exceptional therapeutic programs, seats designed for comfort, and jets that will deliver a quality massage, you’ll ensure that you get the right hot tub to cure what ails you. Read on to find out more about what to look for to get the ultimate hydrotherapy experience. One of the first steps you need to take before buying a hot tub is to consider who will use it and why. This will help you determine which therapeutic features you’ll need to look for. Once you start your search, a major consideration is jet location, as jets that are properly positioned can provide you with a full body massage and target pressure points to relieve tension and pain. 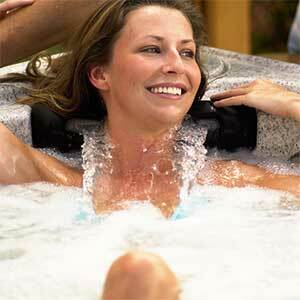 Some of the best jets available are hydrotherapy massage jets. Ask your dealer to point out and explain the jet placement of several models and remember that the number of jets is less important than proper placement. The most common reasons consumers purchase hot tubs include reducing back and leg pain, relieving stress, getting rid of headaches, and recovering from sports injuries or exertion. It is often a good idea to choose a hot tub with a wide variety of therapeutic programs so you know your personal needs will always be met. Experts including sports therapists, physiotherapists, and chiropractors recommend using a hot tub with a four-zone system, as these types of hot tubs offer the maximum in therapeutic benefits. For example, Hydropool hot tubs provide custom therapeutic options through four seats with various jet types and placements. Each seat provides an individualized massage targeting a specific area. These hot tubs also offer eight different therapeutic programs to choose from so each user receives the therapy they need. The best therapeutic hot tubs also offer highly specific therapies designed to address tension and pain in specific locations. As users move from seat to seat, jets offer a multi-pressure massage that changes with each seat so tension is relieved throughout the entire back in stages. Wellness options such as aromatherapy and chromatherapy are essential therapeutic features in a hot tub. Look for a hot tub that offers both scent and light therapy to enhance relaxation and offer outstanding physical and mental relief. Unless you can customize your hot tub, it will be difficult to get the full spectrum of therapeutic and wellness treatments you require. No two users’ needs are the same, so it’s critical that you’re able to create a program that is perfect for you. Make sure to choose a hot tub with programs you can individualize. If you want more help determining what kind of hot tub is best for you, download our free hot tub buyer’s guide.